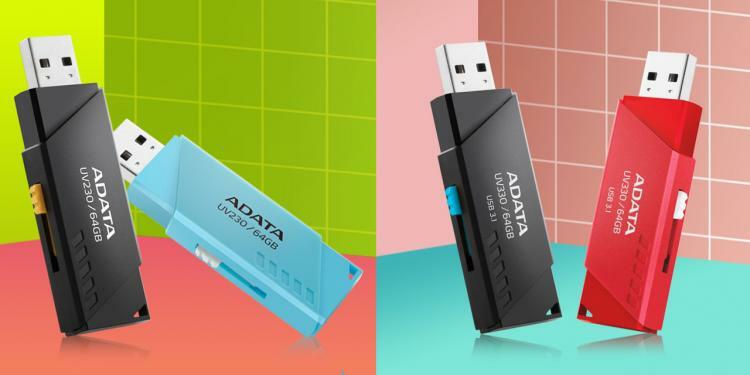 ADATA presents the new UV230 and UV330 flash drives featuring a capless and slide-to-use design offering users a compact and worry-free flash drives. The new flash drive models are offered in budget-friendly USB 2.0 variants and the high-speed USB 3.1 variants which is available in capacities of up to 128GB. ADATA aims to provide the best data storage solution whether you are on a budget or in need of high-speed, high-capacity storage drive. The new UV230 and UV330 offer both affordability, functionality, and style. The budget-friendly ADATA UV230 is offered in capacities of up to 64GB while the speedy UV330 USB 3.1 flash drives are offered up to 128GB capacities. Flash drive caps tend to be a hassle so ADATA designed the UV230 and UV330 to be without it. Aside from the capless design, the quick-slide mechanism neatly protrude and retract into its chassis with ease using one finger. Both flash drives include a dedicated hook for securing them to a strap, lanyard, keychain or other attachments. This further boosts their portability and reduces the chances of misplacing drives and losing valuable data. The UV230 and UV330 are offered in different vibrant colours for a more personal and stylish choice for consumers. The UV230 is available in blue and black while the UV330 is available in red and black colours.